Clearly an underated album but with mixed reviews. It's too pop for the garage heads and I've been put off buying it for years when I read that the re-recordings of 'Faces' and 'What A Girl Can't Do' were deemed to be not as good as the single versions. I was tempted a few times to buy the bootleg on Radioactive but I've never been a fan of their CD masterings. Tom Guernsey sent me a copy of the album on CD recently and I was suitably impressed by the music to go out and seek an original copy on vinyl. Some prices were in the region of $100-$130 but I managed to locate one (not on ebay) for $50 and it was in mint condition, aswell as being the important MONO release. By the way, here's some trivia for you. 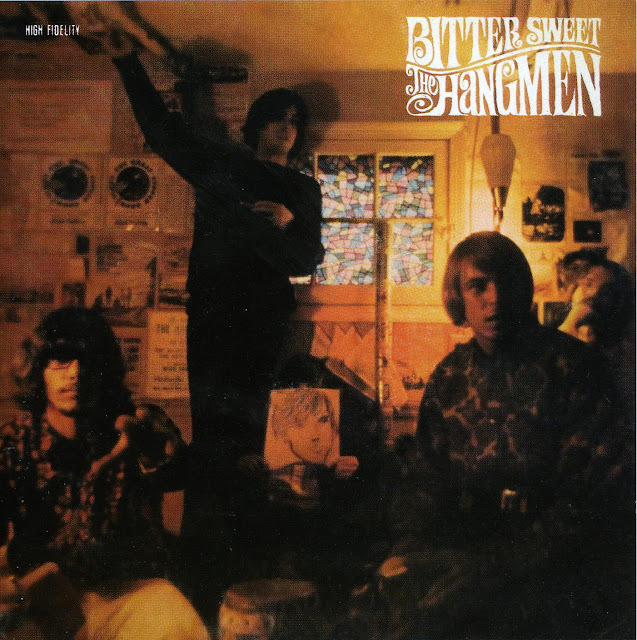 The trippy picture of The Hangmen on the cover of the album was taken in the bedroom of Tom Guernsey's apartment in 1967. Tom is hiding behind the self portrait. 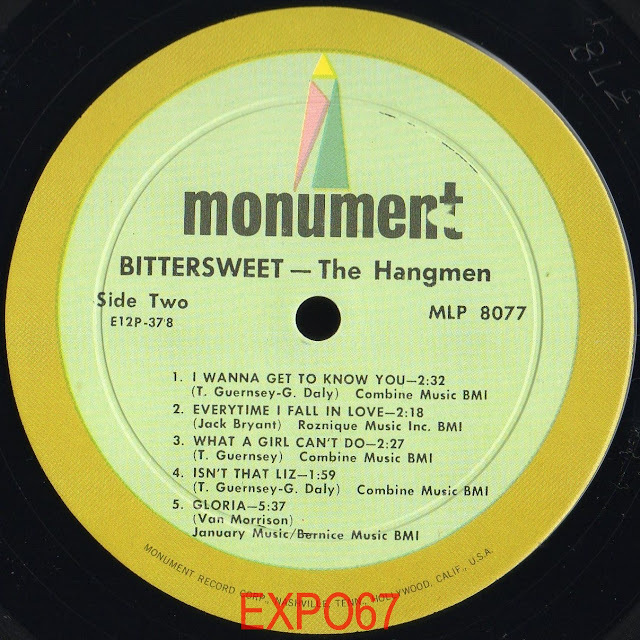 The psychedelic influence for graphics was evident with the logo for the 'Bittersweet' album. This colouful lettering brightened up the back cover. 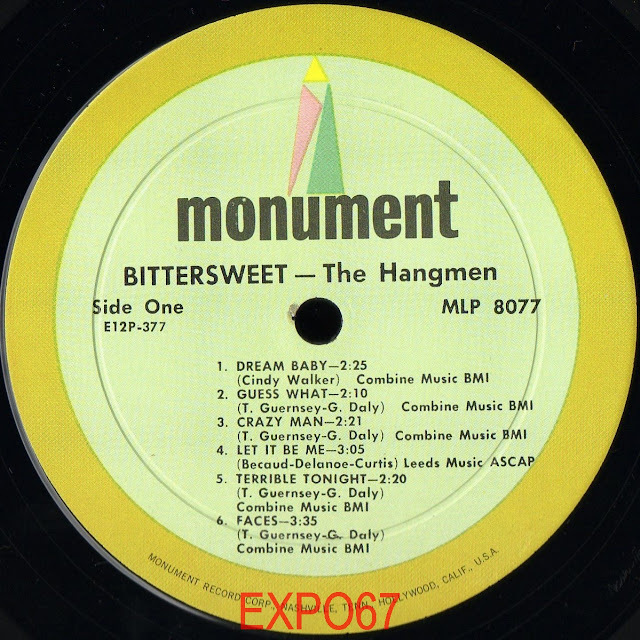 Side One of 'Bittersweet' opens with 'Dream Baby' (also selected from the album as a single). I really dig this sitar and fuzz imbued psychedelic 'Dream Baby' and it clearly was the strongest song/performance on the album IMO. 'Guess What' is another slow ballad. The Hangmen seemed to like this style. 'Crazy Man' ups the pace somewhat and the lead vocals are performed by bass player Paul Dowell. 'Let It Be Me' was the flip of 'Dream Baby'. 'Faces' is a re-recording of the second single and is much different. It's a lot slower with fuzz but this fuzz is not as killer and is sadly burried in the mix. The back-up vocals make up for this though. 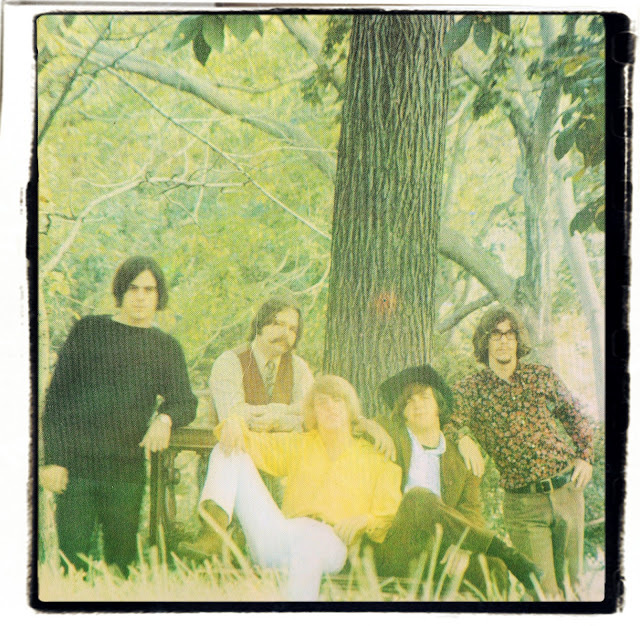 Side Two of 'Bittersweet' kicks off with 'I Wanna Get To Know You', a slow paced song with more than a nod to the Lovin' Spoonful. It's a song that Tom Guernsey is happy with from the Nashville recording sessions and he would have liked it to have been the band's third single instead of 'Dream Baby'. 'Everytime I Fall In Love' is a cover of a song by fellow Washington D.C. band The Fallen Angels. It's a slow heartfelt ballad of 'love gone wrong', a theme so common with mid 60s bands. 'What A Girl Can't Do' is a re-recording of the classic single. I'm not quite sure why The Hangmen wanted to try this one again, maybe it was to give new lead singer Tony Taylor his chance to stamp his authority on the song, or perhaps the band were rushed in the studio and didn't have anymore material? 'Isn't That Liz' is a band original with some fuzz and a neat harmonica break mid way through the song. It's a grower and the tune will stick in your head. 'Gloria' is the famous Van Morrison song originally recorded by his band Them. Many mid 60s American bands either played this song live at gigs or recorded their own version. I've never heard a better version than the original by Them. The Hangmen performance is a slowed down and extended take with a good vocal performance by Tony Taylor. I asked Tom Guernsey how he felt about the album and if he was satisfied with it. "Some of the songs on the album stand up better than others...for example i really l like "I wanna Get To Know You" (particularly the harmonies and the instrumental intro/ ending) and "Crazy Man" has some pretty good lyrics and an excellent bridge. Although everything we wrote at the time was put under Guernsey/Daly, the two songs I mentioned are largely the work of my song writing partner George Daly. We were following the lead of Lennon & McCartney, who as I think you probably know, put all their songs under both writers names even if only one of them wrote it...such as "Yesterday"
...terrible tonight...let it be me...aaa..
well both sides are killers! thanks for the feedback Pablo. The Hangmen LP is indeed a grower. At first I never bothered with it having read bad reviews but I was pleasantly surprised at the 'pop' element. I suppose the reviews I read must have been by garage nazis.